I received an email from my friend (and ex-colleague) Martin, who retired to the Caribbean more than ten years ago. He makes a point I agree with in language more accessible to him than to me (British, that is). Since he’s brilliant (by which of course I mean he agrees with me), I thought I’d let readers hear another voice. Charlie, we’ve emailed a number of times about words like trust (which you pretty much own), trusting (i.e. when a buyer is trusting of the seller), trustworthy (i.e. what a buyer hopes the seller is). As I read the commentary on Obama’s plan to improve the regulation of the financial services sector I am getting somewhat depressed. Not, I hasten to add, because I do not think Obama’s heart is in the right place. My concern is that his regulatory approach doesn’t mandate nor does it seek to combat untrustworthiness. Too often this ‘Nation of Laws’ falls back to the common defense that ‘nothing I did was illegal’ even if it broke all sorts of ethical boundaries with the nadir being reached with the apocryphal words ‘it depends on what the meaning of is, is’. I am reminded (and this was more years ago than I care to remember) of my initial exposure to the English Legal System in the 17th and 18th centuries where, because of the rigidity of the ‘common law’ (i.e. I didn’t do anything illegal), a Court of Chancery grew up where by the Chancellor could grant some type of relief ‘in equity’ which was essentially "a manifestation of the ideas of justice entertained by individual chancellors." While one could argue that the plaintiffs attorney business is a sort of surrogate for relief against the ‘nothing I did was illegal’ defense, I wonder if the US needs something similar to the Court of Chancery where there is some body where a person aggrieved by financial creativity could ask the question, "OK, I know what they did to me was technically legal, but was it ‘right’?" I fear that unless the Obama approach to regulation adopts this sort of philosophy I feel sure that the brilliant students coming our of Law Schools and Business Schools will continue to act in an untrustworthy manner by finding ways of disadvantaging the unsuspecting and trusting buyer. I know many of your clients are in the financial services industry. Is their aim to BE trustworthy or to appear to be trustworthy? Martin, I could not agree with you more. As a (lawyer) friend of mine points out, there is no concept of “truth” in the law as it exists in the US today – there is only evidence. For the MBAs’ part, they (OK, we) replaced relationships with outsourced business processes, and management with metrics, effectively removing any sense of “ethics” by depersonalizing the behavior of human beings. (Maybe it began when we started calling people ‘human capital.’ Note which is the adjective). The combination has been devastating, as you point out. Look at any corporate org chart where you see “ethics,” and the next two words are “and compliance” – as if they were the same thing. As you point out, they are–or ought to be–very different concepts. And while I too think Obama’s heart is in the right place, this effort was all too predictable. He is doing precisely what America’s “best and brightest” are taught to do as “best practices,” namely create mechanical solutions to issues of human behavior. Alter the incentives, redesign the institutions, create more Chinese walls, and–especially–more procedures to comply with. Commonsense suggests that if you treat ethical violations with procedural solutions, you negate the very conscience that made us call it unethical in the first place. Do that long enough, and the word "ethical" will become listed as "archaic" in the dictionary. To flip Ronald Reagan’s words, the act of constantly verifying destroys trust. Excessive compliance measures ruin ethics. Big Brother is death on the human conscience. The trouble with regulatory answers to misconduct is that they foster more cynicism, more degradation of the real issue into mere gotcha contests. They trivialize issues that are, or should be, ethical at heart. As you said. Martin, I honestly believe that the best answer to the decline in trustworthiness lies not primarily in shifting incentives, or in classical regulation. It lies in mass shaming of the untrustworthy by the consuming public. The act of mass shaming galvanizes the public’s conscience. Whether or not any particular Madoff then “gets it” or not is beside the point: a community itself needs to articulate, for itself, that there are standards that lie well above and beyond the common law of “I did nothing wrong.” The best Chancery court may be the blunt instrument of public opinion. Now that’s a scary question. http://trustedadvisor.com/public/trusted_advisor1.png 0 0 Charles H. Green http://trustedadvisor.com/public/trusted_advisor1.png Charles H. Green2009-06-25 10:00:002009-06-25 10:00:00Trustworthiness? Or the Appearance of Trustworthiness? 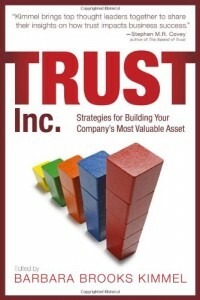 To make sense of personal or business trust strategies, we need to simply distinguish between trusting and being trusted.